“Your entire population is smaller than X.” Replace X with a name of almost any city in the world, and you will have the sentence that people from all around the world love to throw in an Icelander’s face. But everybody loves the underdog, right? However, the question is: are we really underdogs? We are a small nation indeed, but over the last couple of weeks it has felt like we are a lot bigger. The amount of support our national football team has received following its performances at the UEFA EURO 2016 has been indescribable. And now the team is preparing for the quarter- finals against France. The atmosphere surrounding Iceland really takes you back to 2008, when the national handball team reached the final of the 2008 Olympics in Beijing. I remember waking up early in the morning – well, in the eyes of the 16-year-old I was back then it was still night, and head to the cinema in my hometown. People gathered there, some still in their nightgowns, to watch the final between Iceland and France on a big screen. Even though Iceland lost, I still remember the sense of togetherness as the hearts of the entire country beat together with the team. Our boys. The silver medal is described as one of our best moment in sports history, and it’s like reliving these moments now when following the football team in France. 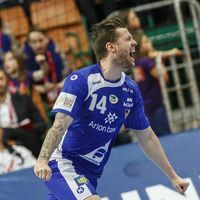 It is the first time Iceland qualified for a major football tournament and got that far – but not many know that one of Iceland’s biggest strengths in football has its roots in handball. Aron Einar Gunnarsson, the football team’s captain, is known for his long throw-ins far into the opposition’s box. Two of Iceland’s six goals so far in France came after his throws – it is a technique he learned during his handball career. Gunnarsson played both handball and football up until he was 15. Then he decided to focus on football and is now leading Iceland as they continue to write new chapters in the nation’s sports history. But Aron is not the only Gunnarsson who made it far after having to choose between different sports. His older brother, Arnor Thor Gunnarsson, faced the exact same dilemma when he was 15. He chose handball and is now a key player for Bergischer HC in the German Bundesliga and a vital part of the Icelandic handball team. “Yes, like Aron I took a decision when I was around 15 years old and decided to quit football and focus only on handball. Back then I had already received a few call-ups for the youth national team in handball but not in football. So the decision was kind of made for me that way,” says Arnor Gunnarsson. In football, Arnor first played as a field player but at the end of his career he had been turned into a goalkeeper. Arnor was even rewarded best goalie at an annual youth tournament in Iceland, but that did not stop him in putting his football career to a rest. His brother Aron, on the other hand, says that the foundation he built when playing handball has come in handy. In particular for his throw-ins when it is not the question of how hard you throw the ball, but how you do it. So does Arnor feel he got something out of his football career which has given him an advantage in handball? “When I was playing football, we did a lot of outdoor running as a part of our training. Because of that, I really feel that my stamina is a bit different from those who have only been in handball. So that’s maybe the thing that has helped me the most,” he says. And being known as a winger that never stops, he clearly has a point there. Gunnarsson, Arnor that is, has been going through a lot of changes recently with the handball national team. After a disappointing performance at the EHF EURO 2016 in Poland, the search for a new coach who would succeed Aron Kristjansson took longer than many would have wanted. Eventually Geir Sveinsson was hired in late March and has not been wasting any time implementing his own system. In Poland, Iceland played with a brand new defence strategy. It was something that Kristjansson had put all his focus on – but failed. Sveinsson has now gone back to the basics; focusing on playing a flat 6:0 defense, while he seems to be more satisfied what the team already had to offer in attack. Iceland secured the ticket to the World Championship 2017 in France earlier this month, but cut it close against Portugal in the play-offs. After winning with three goals on home soil, 26:23, they held on to a one-goal loss in the second game and went through, 46:44, in total. What was noticeable in these two games was exactly the changes Sveinsson made in defence – and which worked like a charm. That gave Bjorgvin Pall Gustavsson better opportunity to shine in the goal, and even though it was a close call in the end, Sveinsson’s changes really seem to have made a difference in this short period of time. His new approach is not only visible on the court. He has put more focus on how players face the tasks ahead and also places emphasis on the mentality. Something that Arnor Gunnarsson says is a bit German, but maybe comes to little surprise as Sveinsson was the head coach of SC Magdeburg until last year. “He wants the group to really stick together and be professional in every way, both on and off the court. Every player is supposed to come with full focus to every practice but as soon as it’s over we can lighten the mood and joke around. That atmosphere reminds me of what I have experienced in Germany and it will only have positive effects on the team. Geir is a fantastic coach and really respected, just as he was as a player. It’s a big honour to play for him,” says Gunnarsson. If Sveinsson continues to play his cards the right way, there is no reason that could not happen. He was able to completely turn the defence around in no time – what is he capable of doing before the upcoming EHF EURO 2018 Qualification and the World Champinship in January? But the story now is that Iceland’s football team has made the whole nation even crazier about sports over the last couple of weeks. Just like our handball team has done so often in the past.